Shopping BuyDig.com, is a one-stop Holiday shop, to take care of all of your gift buying needs this year. BuyDig.com has something for everyone this holiday season, gifts ranging from cameras for photography lovers to televisions, such as the Samsung UN46H5203 – 46-Inch Full HD 60Hz 1080p Smart TV Clear Motion Rate 120 for the die hard sports fan. 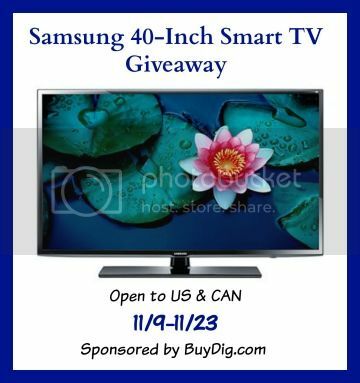 Speaking of electronics in their TV Department, you can enter for a chance to win a Samsung UN40H5203 40-Inch Full HD 60Hz 1080p Smart TV Clear Motion Rate 120 sponsored by BuyDig. Your family will love waking up to find this Wi-Fi enabled, App capable, HD television waiting for them under the tree! The giveaway will run from 11/9-11/23 and is open to residents of the US and Canada, 18+. Excludes Quebec and areas where prohibited by law. Only one entrant per household, email address or mailing address. I would really like to own a nikon camera. Thanks for the great giveaway. My Husbands just broke and could really use a good one as a truck driver. The Pentax K-500 Black w/ 18-55mm Lens 16MP Digital SLR Camera Kit would be great to have. My daughter has been nagging me for one of these, an iPod Touch 16GB iOS 7 White & Silver (5th Generation) Newest Model. LOL – I feel your pain Stephanie! Love this giveaway would be great to have a TV in house for my family and myself. Thanks for having this chance for everyone! I like a lot of things on their website, though here is a link to my fav of fave’s on their website. Thank you for giving me this chance, my family loves your website too!! God Bless!! I’d love to have Coleman Duo2 2V9WP Rugged Dual Screen Waterproof Camera. It would be great for camping and fishing trips. I would love to win the Samsung TV to put in my daughter’s bedroom. Past Week’s Posts at FCS Agent Ace Crate & Barrel Gift Cards Giveaway – Two Winners!